Slavi Binev is a Bulgarian politician, businessman and sports competitor. He was born on December 10, 1965, in Sofia. Binev's grandfather, Georgi Karadzhov, was one of Bulgaria's well-known authors of children literature and of love poetry. His father, Pencho Binev, is a distinguished scholar with recognized inventions in the field of the pharmaceutical chemistry, power engineering and organic synthesis. His mother, Petranka Bineva, was a journalist and a banker. Binev is a graduate of the French Language High School in Sofia and of the "Vasil Levski" National Sports Academy, also in the capital (1986-1990) with Master's Degree as Professional Tennis and Boxing Coach. In 1988 – 1990, he studied sports journalism at the Academy. He is currently in the process of completing a PhD in Social Psychology at the Bulgarian Academy of Sciences. From the beginning of the 90s until 2006, Slavi Binev had been one of the main shareholders in R – System Holding AD, (formerly Royal Holding Co.). Between 1994 and 2007, he was Chairman of the Supervisory Counsel of the company, which was ranked by the Bulgarian Chamber of Commerce and Industry 34th among the top 50 holdings, according to the maximum rate of profit for 2003. 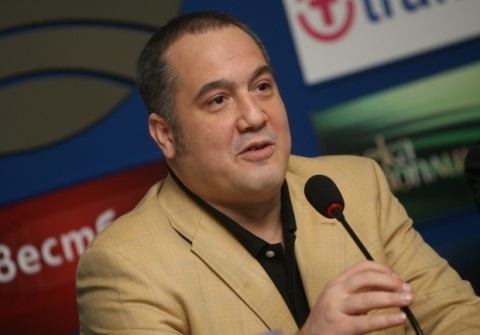 At the time, Washington Times published an editorial article, entitled "New Kids on the Eastern Block," dedicated to Slavi Binev and his business achievements. Binev was elected first term Member of the European Parliament in 2007, and is currently a second term independent MEP, after being reelected in 2009. At the EP he is Member of the Parliamentary Committee on Economic and Monetary Affairs, Deputy Member of the Subcommittee on Human Rights, Chairman of the INETGROUP of Sport, Member of the Ecumenical Prayer Breakfast INTREGROUP, and member of a number of other delegations and groups. Binev is also deeply involved in sports – he has 5th Dan Taekwondo, and is a multiple Taekwondo champion of Bulgaria and winner in numerous international competitions – European and Balkan champion. Binev is an international Taekwondo referee, and has been coach of the Bulgarian International Taekwondo Team, Vice-president of the Bulgarian Taekwondo Federation, member of the Bulgarian Olympic Committee, and Member of the Research Committee in the World Taekwondo Federation, among others. In 2007, he was initiated as Archon of the Orthodox Church. Binev is married and has five children, and a granddaughter, Niya, a child of his daughter Martina. In February 2012, the MEP launched a new civic movement, dubbed Civic Movement for Real Democracy, GORD, (in Bulgarian the abbreviation means PROUD) and a new political party "Conservative Party Movement of Success." A pre-election coalition between GORD, the Free People party and two other political formations was launched at the end of March, 2013. A pre-election coalition – Gorda Bulgaria (Proud Bulgaria) between GORD, the Free People party and two other political formations was launched at the end of March, 2013. How was this coalition formed? The core idea of GORD is to not be just another political party, but a union of political formations, civil associations, and individuals who have never participated in the rule of the country or have served it in some way. We, from the Proud Bulgaria Coalition, opened the door and then other political parties, civil associations, and respected individuals walked through it. As we talk about the Coalition, I must ask you something largely reported in a number of media, but never officially confirmed – is the Free People party close to Alexey Petrov? I think the question must be asked reversely – is Alexey Petrov feeling close to the issues raised by the Free People Party? Parties, contrary to what Boyko Borisov, GERB and some other formations of the "leader" type attempted to persuade us, are not private property of someone. As far as hints and the context that we joined efforts with Borisov's enemies, I do not think this is something bad; it is even mandatory. Your Coalition nominated Prof Boyan Durankev from the University for National and Global Economy for ballot leader and for the next Prime Minister of the country – what are the qualities that made you entrust him with such vote of confidence? This is a nomination of the college students which we honored. I, myself, believe that we must pave the way for the academic elite. Prof Durankiev is not only part of such elite, but he has another virtue – he demonstrated character and courage, which are not that typical in academic circles. Only people convinced in their own qualities can act in such manner, while our opponents have always picked incompetent individuals so that their own simplicity can shine on their backdrop. Tell us more about these independent college students and the Civil Forum "Promyana" (Change), which nominated Prof Durankev? Without being a member of the Forum, I know that its ideas are embedded in its name – change is something all Bulgarian people wish for, from the bottom of their heart, while the independent college students are the future of our country, not a virtual future, but the future that is knocking on our door. These are our children, now already becoming the men on whose strong shoulders we must lean. You are not leading any ballots – why? All people who have waged a battle against those ruling the country can be in one way or another under the suspicion that their position is not based on principles, but it is rather a matter of personal advancement. What made me refrain from leadership is the fact that I have waged a battle not just against Borisov, but against the entire system which gives opportunities to people like him to lead the country. You call Borisov's and GERB's rule a failure detrimental to the business and to democracy. Can you summarize here the measures that Proud Bulgaria proposes to reinstate them? The first step would be retribution and an audit of the entire Transition Period since the fall of Communism. This will reinstate in Bulgarians not only the faith in justice, but will have a preventive effect for future rulers who would want to rob their people. The second step is to have the same rules for everyone, instead of having the State be "the mother of some and the evil step mother of others;" so that we have rule of law and a country where everyone is equal before the law; where there are no opportunities for the administration to racketeer the business. There are a number of other steps, which I will list here without explaining them. They are written in our economic program. Some of the most important are: bringing an end to the contraband; reexamining the concession contracts pillaging Bulgaria; immediate dismantling of monopolies and bank cartels detrimental for Bulgaria; resurrecting the idea for the establishment of a Development Bank to encourage the advancement of the small, medium and family business, instead of the corporate one. I can speak about this for hours, but I prefer to be given the opportunity to demonstrate it in real life, as the saying goes – "Ye shall know them by their fruits." Some reports labeled the launch of the election campaign of Proud Bulgaria with magic tricks "eccentric," but there was symbolic in it. Can you explain it for our readers? Why do you believe, I am quoting you, that if retribution for the swindlers does not happen during these elections, Bulgaria can expect something in between a Great Soviet October Revolution and a Civil War? People expect solutions, solutions which these rulers cannot offer. People, who see the business only as trading influence, are talking about economy and business. People, who feel no shame from wasting tens of thousands of EUR in party money in lavish European hotels, present themselves as defenders of the poor. Bulgarian people no longer want any of the political formations that have been in the Parliament until now, while the latter are not letting in anything new. The current "partoracy" can buy some time by using media and pollsters' "criminal" actions, but they cannot buy a favorable outcome. All who know me, know quite well that my eccentric forecasts very often turn into reality. I think it will be the same this time around, meaning if new faces like us are not allowed into the legislation as representatives of the people, who revolted before it became trendy to do so, I guarantee you that we will end with these two very difficult choices - a Great Soviet October Revolution or a Civil War. You are a very strong critic of Borisov; you call him Buddha in confirming you believe the leaked information from the secret anti-mafia police file codenamed Budha about his past ties with organized crime to be true. Some accuse you of personal vdendetta? If someone is responsible for the misery, the poverty, and the progressive stupidity of Bulgarian people, yes, I am waging a personal battle against this person! If someone is inciting Bulgarian men to kill their families and then commit suicide, to self-immolate and cut off their body parts in front of video cameras, then, yes, I am waging a personal battle against this person! Regarding the information about Buddha, I think that in the light of the latest scandals, this question is turning into a rhetorical one. This is the least Borisov can be accused of. Pollsters give your Coalition between 0.7% and 2.5% of the vote – do you believe you stand a chance to win parliamentary seats? I would turn this question around and ask – would Bulgarians be lucky enough and stand the chance for Proud Bulgaria to enter the Parliament? Would the "partocracy" allow successful people, who have solutions for the problems, to be among the legislators instead of finding excuses in the problems? Good models and programs are hated the most by the incompetent. There is doubt not if we could win parliamentary seats, but rather – are we going to be allowed to do it? However, one thing is certain – the more they try to stop us, the more solemn our entry will be, because no one can stop the wind. Do you harbor any hope for fair elections? Only if the caretaker Prime Minister and the President remove from the post of caretaker Interior Minister this former lady translator; remove the other translator – the Chief Secretary of the Interior, along with the Chief of the Sofia Police Directorate, and if there is an immediate arrest of Boyko Borisov and Tsvetan Tsvetanov. Only then we can make some steps towards fair elections. However, the elections' "unfairness" is not typical only for the campaign period - we should mention here the obliging media and pollsters, and those always ready to get paid. These are processes, but the first step is still the most important. You have demanded the resignation of Krasimira Medarova as Head of the Central Electoral Commission, CEC, and civil control on it. Why? These elections are a striking example of arrogant and unprecedented abuse of democracy. Medarova should not only be dismissed, but also investigated for not granting equal rights to Proud Bulgaria as she did for other participants in the elections. This is the smallest sin of CEC though, as they failed in full to become the guarantor of a democratic vote. What do you think about the paid election campaign ads and campaign clips on State media – the Bulgarian National Radio and Television? This is part of determining the winners in advance. How can we talk about equal rights and rule of law in Bulgaria when those who lied to Bulgarian people have been given BGN 200 M in State subsidies? The political battle turned into a very expensive war which is fought not with arguments, but with bribes. And what do you think about the "Bulgarian Watergate" scandal? Is there indeed mass unauthorized spying in the country? Have you been spied on? It seems Europe is very carefully avoiding becoming involved? No, as you know, Europe is no longer keeping silent. Representatives of 4 from the total of 6 parties in the Coordinating Council of the European Parliament's Committee on Civil Liberties, Justice and Home Affairs (LIBE) backed me, and Tsvetanov will no longer travel in Europe, except to explain his criminal activities. Regarding been spied on – ask yourselves who is enemy number one of the mafia – in sports, on the streets, in business? I have been spied on over two, even three reasons – as a political opponent, as a business opponent, but mostly because I am not only the sole person opposing those who no one dares to oppose, but I am also surviving and prevailing. You brought to Bulgaria the UK nationalist Nigel Farage. Many Bulgarians feel offended by his attacks and the slamming of Bulgaria? Dou you think Farage is right in his opinions? Obviously, you too are pray of clich?s and manipulated information being spread in Bulgaria... Farage is not a nationalist, but an EU-skeptic. He is not against Bulgarians, but against the criminal rule that chases them away from their homeland. He is not insulted, but surprised. It is like in this joke about someone during the Socialist regime winning a Soviet-made Volga car from the lottery, however, the truth was that he did not win it, but was rather hit by it, and it was not a Volga, but a Moskvich. So, I advise Bulgarians, who wish to learn the real news, to not overly trust the spokespersons of those in power.